.......What does it take to be balanced? What does balance look like? In a busy world, how do we find balance? Where there are constant demands on our time, energy, attention and commitments, how do we traverse the constant swing of not enough to way too much and slow down to the sacred in between? Do you know where that is? Have you ever been there? Discovered its landscape? Seen the rewards reaped in your life or are you still yo-yo-ing along? There is a huge pressure on women (some of it self imposed) to be and do everything. To follow our calling, earn money, maybe have a career, even run a business, spend time with friends and family being fully present, look after the home and any dependants (this includes your fluffy babies), maybe caring for a sick relative AND still have time to be present for a beloved. It's a taxing and near impossible juggling act. It's an experience that is dangerous to our health and stability. What ever way your personal story looks to you, I'm sure you can see a common thread. Never ending commitments. There isn't enough time! There is too much to do! How on earth am I going to fit all of this in? Oh and is there any personal time in there or does that also become a commitment that quite frankly falls to the end of the list? Come on a sacred journey with me as we activate the inner parts of ourselves so we can let go of that which no longer serves us. I am here to open a door. Are you ready to walk through? I have never painted before. Apart from when I was a child. That's not quite true … I have never finished a painting before. I had to do an art module at university and the feedback from the teacher not only made me feel like giving up… I did give up. Having attended some of Jacquie's workshops before I knew that she wouldn't make me feel like that, but I did wonder how she was going to get me to paint anything even halfway decent, let alone a work of art I am extremely proud of and totally in love with. The theme of balance particularly resonated with me and the meditations and visioning were fantastically healing in their own right. To then start to create art from these experiences was extremely powerful. I found myself totally absorbed in the process. There were times I found it challenging and the critic took over wanting everything to be perfect and there were times where I felt completely able to abandon myself to the process. Jacquie was really supportive in letting us explore the critic and the muse relationship. The preparation and care that she poured into the weekend made me feel very valued. The very clear explanations and demonstrations of how to do each stage were extremely useful, but the gentle encouragement and space to do our own thing made this the polar opposite of the art class I did at Uni! It has been such an incredible experience and these words do not do it justice. I have since ordered a light to light up my painting when I hang it and paints, brushes and a canvas. I am looking forward to painting again. I am sure it won't be the same but if it gives me just a fraction of the joy then it's worth doing. Thank you so much Jacquie. There is no greater journey than the one you must take to discover all of the mysteries that lie within you. All you need to bring is yourself, dressed in clothes that you don't mind getting a bit of paint on and a mind ready for inquiry. Coming from out of area? Why not check out the beautiful accommodation at the White Hart in the nearby village of Ufford here - Only 3-5 mins drive or 10-15 minute walk from the venue and highly recommended for their food, service and rooms. Not included in the workshop booking. ​Terms: Booking is required to attend. No refunds. Booking onto this workshop shows a commitment to yourself to show up and begin to make positive changes in your life. I can't wait to get creative with you! If you're a clear YES to join me on this adventure, book a place by clicking on a button at the bottom of this page. Working with Jacquie to explore my relationship with the idea of balance through Intentional Creativity was a deep dive with surprising and lush results! Jacquie guided me every step with questions that felt utterly relevant to my life, great listening and very helpful assistance with re-framing my thoughts when I got stuck in an extra-big concept. The painting process was magical and I loved how well it tied in with the questions she gave me for deepening. I had surprises in my visioning, in my realizations, in my painting and in what I heard the painting tell me. I felt held and supported through it all. Jacquie's guidance was invaluable and her commitment to my having a full experience was unflappable.I am so glad I took this journey with her... And with myself... And grateful to Jacquie for creating a way for me to look these ideas and travel to greater expansion within them. I am sitting here gazing at the amazing image from the weekend that Jacquie facilitated in me and I am awestruck and so grateful. I survey the colour and the energy and a smile comes to my face. I receive the feedback from friends and clients (one woman tells me she likes her very much as she is so warm) who view her (‘she who is time in balance’) and I experience their amazement. From some the comments that ‘it's been a long time’. To be back in touch with a creative and a playful part of myself as well as a robust process experience was such a valuable experience. It is definitely a journey I will wish to return to time and time again. Jacquie’s support and empathy in the face of the challenges of transitions and trust was sensitive and warm. It was also such a joyous time with plenty of laughter and hugs! Will be definitely doing this again and a lot! in her late 20's. 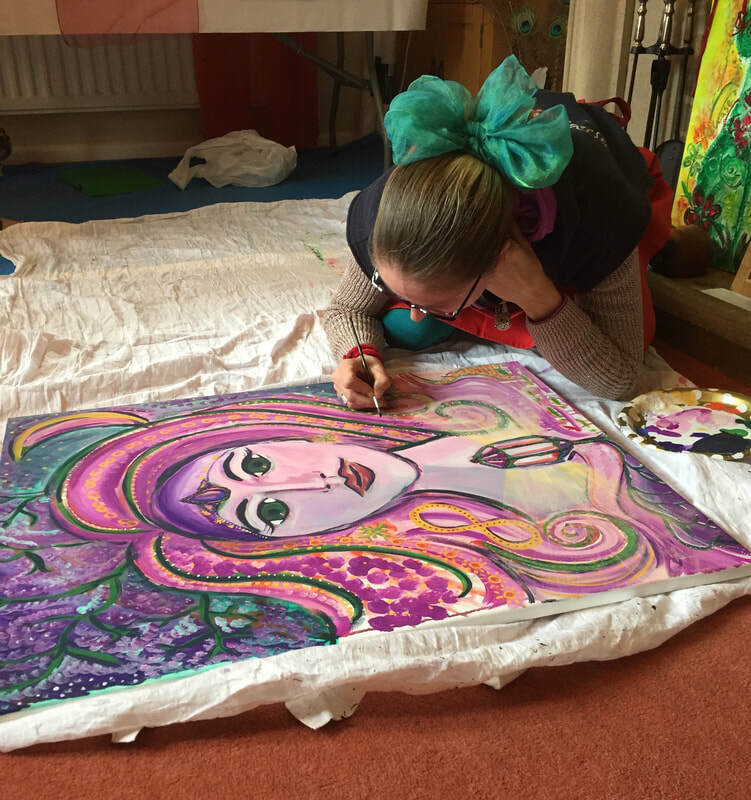 Hundreds of paintings and images later she still believes it is one of the best ways to move stuck energy or thought patterns and connect with the inner world. On a mission to create wholeness in her own being, Jacquie serves women who wish to reconnect to their creative essence, remember passion and discover the freedom of self expression. Jacquie is an Intentional Creativity Teacher, Guild Member and 2018 Color of Women Graduate. or emerge through you and your inner world which then becomes an outpouring through pattern, colours and symbolism. Through ritual, caring, deep listening and intention we bring soul truths and essence into mindful form. Join us in a REVOLUTION! Set your soul free though the creative process!